On February 24th, nonprofit leaders from around the country visited the Star Apartments as part of the Bank of America Neighborhood Builders program. They met with Trust staff and partners to learn about the innovative design and cross-sector partnerships that make permanent supportive housing projects like the Star Apartments possible. Attendees toured resident units, common areas, and wellness facilities, and visited the Los Angeles County Department of Health Service‘s ground floor offices and medical clinic. There attendees met with Marc Trotz, Director of Housing for Health, who explained how the Department of Health Services is working with Skid Row Housing Trust to link homeless patients to housing. 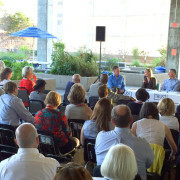 Following the tour, Bank of America hosted a panel in the Star’s garden to explore how partnerships between public institutions and private nonprofits can better address homelessness. Panelists Elise Buik, United Way President and CEO, Mark Loranger, Chrysalis President and CEO, Jan Perry, Los Angeles Economic and Workforce Development General Manager, and Mike Alvidrez, Skid Row Housing Trust CEO, discussed how leaders throughout the community can collaborate to develop effective solutions to the most pressing issues. Bank of America Neighborhood Builders program strengthens nonprofit leaders and supports nonprofit organizations through grants and leadership development, creating a national network of peers focused on permanently addressing social issues. It is the nation’s largest philanthropic investment in nonprofit leadership development.